James Tracy (image left) responds to questions about his firing, and about press reports of events that have swirled around him. “Why was he fired? I mean, why was he really fired? What did he do? What did he do to bring this down on himself? What happened to Professor James Tracy? “MIAMI — A Florida Atlantic University professor who suggested in blog postings and radio interviews that the 2012 massacre of children at Sandy Hook Elementary and other mass shootings were a hoax designed by the Obama administration to boost support for gun control was fired Tuesday. Q: Did you harass Lenny and Veronique Pozner about their son, Noah? In March of 2015, Lenny Pozner, acting on behalf of his “HONR Network,” filed a copyright infringement claim with Automattic, the ISP and parent company of WordPress.com, where my blog, Memory Hole, is housed. Pozner/HONR Network demanded that I take down an image that Pozner purports to hold copyright ownership in. This well-known photograph, purportedly of [Lenny’s son] Noah Pozner, was voluntarily provided to the press by the Pozners in December 2012 following the Sandy Hook massacre event and has since been reproduced millions of times in print, electronic, and online media throughout the world. An identical photo of Noah Pozner also appeared in December 2014 in the wake of a school massacre in Peshawar Pakistan, purportedly representing a child victim in that shooting. I wrote an article in January 2015 on the re-emergence of this image and included the photo in question. Even the BBC eventually acknowledged how the photo first appeared following the 2012 Newtown massacre. When Automattic/Wordpress presented me with Pozner’s takedown request it remarked that my inclusion of the photo in the post constituted “fair use” under US copyright law, which provides for republication of copyrighted material for the purpose of “commentary or criticism.” Nonetheless, I removed the photograph from my blog, and responded to the allegations, referencing free speech concerns and asking for documentation and evidence supporting Pozner’s copyright claims. To my knowledge, I am not aware of any journalistic outlet that has ever attempted to accurately report this. Q: How do you view free speech and the 1st Amendment, in light of what is happening to you? Free speech and academic freedom are closely intertwined. When school officials at FAU [Florida Atlantic University] initially expressed their concerns about my blog in 2013, I explained to them that if I could not practice my constitutional rights during my personal time, then my right to academic freedom and professional autonomy on the job is likewise threatened. 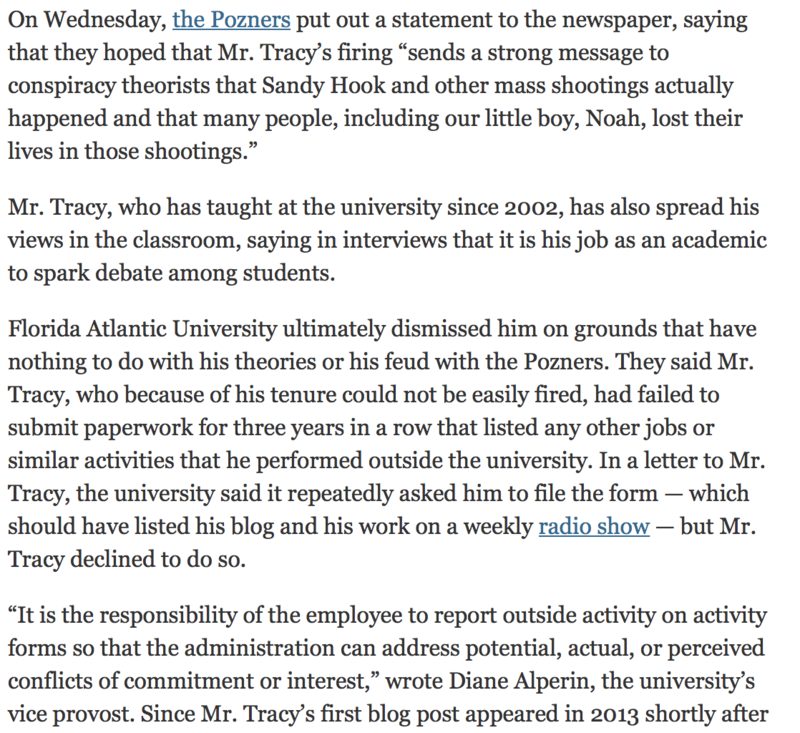 This is the case for university faculty at FAU and throughout the country. The American Association of University Professors and The Foundation for Individual Rights in Education supported my stance in letters of protest to school officials when FAU first attempted to discipline me for my personal blogging in March of 2013. Regardless of the lies told by the Pozners and their media allies, I don’t think there’s any question given what has transpired that FAU has acted wrongfully, and in violation of its own principals of academic freedom, institutional tenure and my constitutional rights. Q: On what basis did the University fire you? FAU’s contention is that I failed to file “outside activity” forms for my personal blog. In January of 2013, they made the same request and at that time I explained that such endeavors are personal and protected by the First Amendment. The administration fell silent for 34 months, and then abruptly resurrected this unconstitutional basis as cause for termination in late December 2015. For their exact “reasoning”, see FAU’s Notice of Termination, dated January 6, 2016. Q: Before this situation finally blew up, you must have known you were on a collision course with the University. What were your thoughts about that? I had no idea that university officials would so brazenly violate the well-established principals of academic freedom and my constitutional rights. In 2014, a new president, John Kelly, was recruited from Clemson University and installed at Florida Atlantic. His administration was characterized to me by one senior FAU faculty member as the most anti-faculty administration in thirty-plus years. This administration has proceeded to discipline or threaten with discipline several faculty who’ve made public pronouncements that Kelly and his inner circle disfavor. In September 2015 the Kelly administration attempted to effectively eliminate tenure by implementing a controversial post-tenure review process that faculty eventually caught wind of and protested. I also reported on that episode. See James Tracy, “Academic Freedom Threatened in America: The Policy of Post Tenure Review,” Global Research, September 20, 2015. Q: In a similar vein, people must have been telling you, in the past few years, that you were treading on dangerous ground, relative to job security. How did you respond? I can’t recall any colleague suggesting that I was in danger of being disciplined, much less being stripped of tenure and fired. I was confident that tenure and the First Amendment still had meaning at FAU. I was obviously proven wrong. Q: Do you believe your present situation is a test case for academic freedom in America? Absolutely—for academic freedom, freedom of speech, and freedom of the press. All of these protections exist so that faculty and citizens can examine, research, and publicize the potential malfeasance and wrongdoing of those in power. As some academics and journalists have come to realize, however, is the unwritten code guiding what topics can actually be addressed. Political assassinations and similar events are often deemed suspect and off-limits. I think this is strongly-rooted in the misleading yet almost uniformly adhered to notion that we live in an “open society,” a mythic pluralism overseen by properly functioning political institutions inhabited by fair-minded political leaders and bureaucrats, all of whom have our best interests at heart. Of course, universities are a central part of this mythic democratic order. Researching such difficult subject matter calls the legitimacy of this system into question. At the same time controversial and poorly-understood topics are exactly what tenure and academic freedom exist to foster and protect. Q: Is anyone at your University defending you? I have maintained contact with most of the colleagues I’ve come to know in my thirteen years at FAU. They understand how I have been defamed in the press and recognize the grave injustice of the termination. Yet not nearly enough people have condemned the FAU administrators’ action, particularly the egregiousness of their conduct. As noted, some faculty clearly fear retaliation, and rightly so. Others both at FAU and elsewhere have simply bought the disinformation the news media have circulated without examining the facts, which is the most painless and convenient course of action. Q: What would you say to people who believe your claim about Sandy Hook is completely absurd? You can’t reason someone out of a position they weren’t reasoned into in the first place. Most challengers of my analyses and criticisms of unbelievable official narratives have not even attempted to explore the evidence researchers and journalists have presented through alternative media. It’s much easier to shoot the messenger, particularly when the messenger is framed as an insensitive deviant, and refrain from critical thinking. Q: Playing Devil’s advocate for a minute—it’s one thing to espouse a controversial view in a college classroom, but when grieving parents feel pain because you’re going after them, all bets are off, and your University has a right to terminate you, on the basis that you’re crossing a moral line and bringing shame to the institution. I didn’t “go after” anyone, even though that’s how the legacy news media chose to present and cultivate the controversy. In the immediate wake of FAU’s public announcement that it was poised to terminate my employment on December 16, 2015 the media assumed that I was being fired because of my public comment and letter to Pozner’s HONR Network. Yet the administration fired me on a technicality that cannot warrant the termination of any tenured faculty member, particularly one such as myself who since 2002 has established an impeccable record of research, teaching and service at FAU. I contend that I merely sought the truth, did my job and engaged in constitutionally protected activities. I did not bring shame on FAU. The disclaimer on my blog specifically states that I don’t speak for FAU. In fact, FAU has brought shame to itself by violating long standing principals of academic freedom, and by violating constitutional rights that it is supposed to safeguard and protect. Q: There is going to be a University hearing, at which you’ll defend yourself against job termination? What shape do you anticipate that hearing will take? In January 2016, I dropped the faculty union-appointed attorney and hired a counsel of my own choosing who I believe will be a stronger advocate. While I cannot discuss any case details or specifics, it is my understanding that any legal action will be directed at those who have violated my constitutional rights, and I have the right to a trial by jury. This is how the proceedings will take shape, unless a Court determines that I am entitled to relief as a matter of law without a trial. Q: Here are several questions together; sort them out in whatever way you want to: How do you separate the right to free speech, the right to express your conclusions about Sandy Hook, from the content and substance of your conclusions? What’s the primary issue here? Did your University fire you because you’ve expressed a very controversial view, or because you’ve become embroiled in a conflict with the Pozners? Regardless of how the FAU administration dressed this matter up I don’t believe there’s really any question that I was fired for exercising my constitutional rights. Q: If your tenured employment is re-established there, how will you go forward? A perfect definition of an intellectual slave, in my view, is someone who recognizes truth but fears to publicly acknowledge or affirm it. I would very much wish to have my job back. Yet if this were achieved I would remain concerned about efforts by school officials and others to infringe on my constitutional rights and harm me for standing up for my rights, as well as the rights of others. Q: Do you believe there are people trying to avoid the issue of free speech and academic freedom in your situation? Do you believe they’re shading this controversy and mischaracterizing it, in order to invent other reasons for firing you, so they don’t have to face the question of freedom head-on? The fact that FAU administrators have chosen to fire me on pretextual grounds is ample proof that they must at all costs avoid the questions of academic freedom and free speech. Q: Have you looked for help where you thought you might get it, only to be ignored or rejected? I want to thank those who have stood by me and shown their support. I think it would be best to leave it at that. Q: I understand the Pozners claim you questioned, or doubted, or denied that their son died during the Sandy Hook School shooting. Is that correct? Yes, this is what the Pozners claim in their December 10 article published by the Sun-Sentinel. Q: Did you ask the Pozners for proof that their son died, that he wasn’t still alive? 1. Proof of your identity via copy of a government-issued document, such as a state driver’s license or passport. 2. Proof of your relationship to the deceased party, Noah Pozner, whose alleged photograph appears in the image in question referenced above. 3. Proof of your ownership of said image via a signed and notarized statement from a qualified and licensed forensic expert substantiating your legal ownership of said image, including the date and time of the image’s capture. The text of the letter is available here: “HONR Network, ‘Lenny Pozner’ Fall Silent on Copyright Infringement Claim”. Q: Could you describe the position you’ve taken regarding the Sandy Hook school shooing? My position from December 2012 has been that the corporate news media never did their job in reporting the Sandy Hook massacre. We now know without any doubt that the actual event differed greatly from what the American public have been told, and as with most poorly-understood terror events the media never backtracked to further investigate the case and admit their “errors” in reportage, some of which now appear to have been intentional. If Americans are going to have an honest debate and possibly endorse policy changes further compromising the Second Amendment such an exchange needs to be based on facts rather than on the media disinformation that’s created a mythology of misplaced fear. Q: Just to clarify, your letter to Lenny Pozner’s HONR group was essentially asking him to verify he was who he said he was; that he was the father of Noah Pozner; and that the photo of Noah was owned by him. These requests were part of your investigation into the Sandy Hook shooting. You were trying to establish whether the shooting actually took place or was a staged hoax in which no one died. Correct? Florida Atlantic University is a Florida state institution. It is an extension of state government. Therefore, its decisions about free speech and limits are government decisions. The government is telling a tenured professor he went too far in speaking and writing freely. It fired him. It entered the dark regions, where morbid dislike for someone else’s reasoning process takes precedence over his right to speak and write. This is what bureaucracy does. It likes doing it. It wants to limit free speech. It’s tired of free speech. It’s an annoyance. And worse, free speech can expose the nature and the actions of the bureaucracy. Free speech is untamed. Free speech can even, God forbid, employ reasoning and evidence and actually make a formal argument, and attempt to establish a case. People “have to be cured of that practice.” It’s dangerous to the State. Well, here is a theory. If one college in America had the balls to defend one of its own who is expressing a very unpopular view—if one college made that call and stood by it and loudly attacked anyone who tried to impinge on that freedom…who knows what might happen? Who knows how the tide might turn? Who knows how many people might wake up? “As president of Florida Atlantic University [note: supposed quote],, I wanted to bring Professor Tracy here today to give us a complete presentation of his views and his position on the Sandy Hook school shooting. He has now done that, for the last three hours, in front of five thousand people and the press. I thank him for that. There is no ‘we’ here. I’m not going to tell you what ‘we, the University’ think of all this. I’m not in the business of making ‘we’ pronouncements when it comes to research and conclusion. I don’t care what anyone thinks or believes or concludes about Professor Tracy’s stance. He has made his case. If any person or group thinks they can come at this University now and demand we censure Professor Tracy or fire him, be ready for war. I hold up the First Amendment of the Constitution. It’s not just a shield. It’s a sword. I will use it. And you won’t like what it does to you. Somewhere, people have to make a stand for the law and what the law embodies and refers to—which is the natural right of the individual to speak freely. This University is that place. Right now. If you can’t tell the difference between what you think of what someone else is saying and his right to say it, without interruption or censure, you are socially and politically insane. You need help, and the help should come in the form of education. This University is in that business. We are that island. If you want a war on that subject, bring it. But I warn you. You know, something like that. Something we really need. Jon Rappoport The author of three explosive collections, THE MATRIX REVEALED, EXIT FROM THE MATRIX, and POWER OUTSIDE THE MATRIX, Jon was a candidate for a US Congressional seat in the 29th District of California. He maintains a consulting practice for private clients, the purpose of which is the expansion of personal creative power. Nominated for a Pulitzer Prize, he has worked as an investigative reporter for 30 years, writing articles on politics, medicine, and health for CBS Healthwatch, LA Weekly, Spin Magazine, Stern, and other newspapers and magazines in the US and Europe. Jon has delivered lectures and seminars on global politics, health, logic, and creative power to audiences around the world. You can sign up for his free NoMoreFakeNews emails here or his free OutsideTheRealityMachine emails here.